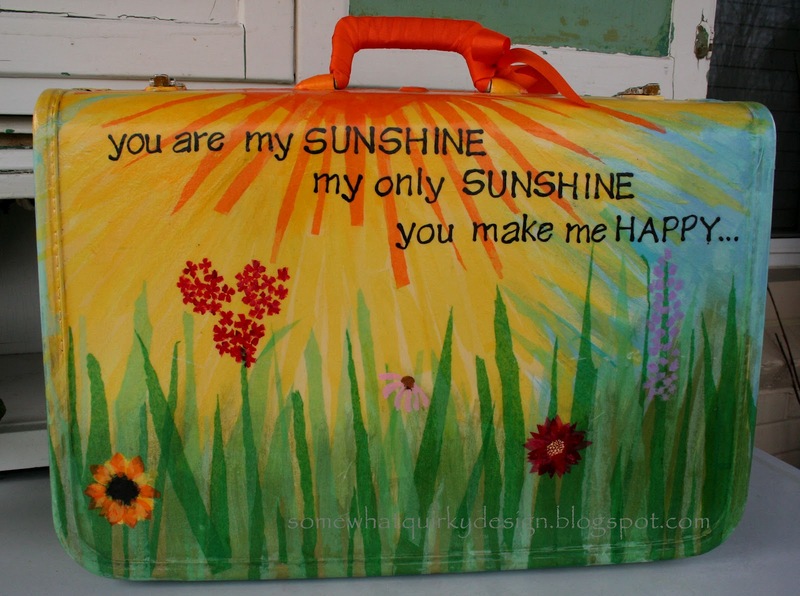 Last week I showed you my little "sunshine suitcase" that I crafted from an old suitcase I found in my neighbors trash pile. The post included a tutorial for INSIDE of the suitcase. Today I'm going to show you how to do the OUTSIDE of the suitcase. make a non-painter look like a painter. I am a non-painter. I can paint the heck out of a wall, furniture, stencil, etc. I cannot paint pictures to save my soul. Daughter Quirky has a college degree in OIL PAINTING. SHE is a painter. Today I want to show you how to be a "non-painter" too. 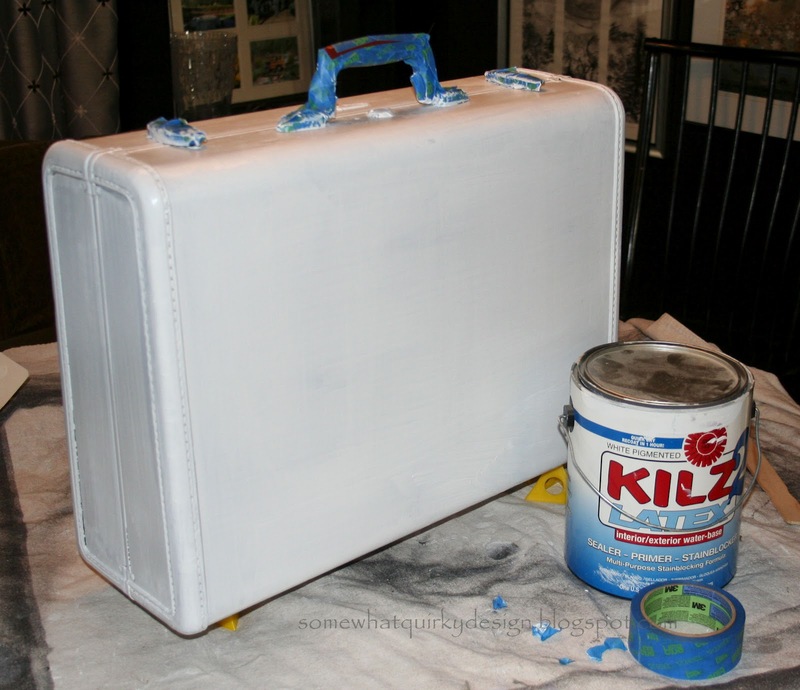 Take a suitcase ( or board, or piece of cardboard, or a car, or a house.....) and paint it with primer. I taped up the metal hardware. You can paint these parts, but I worry about the wear and tear pulling the paint off. 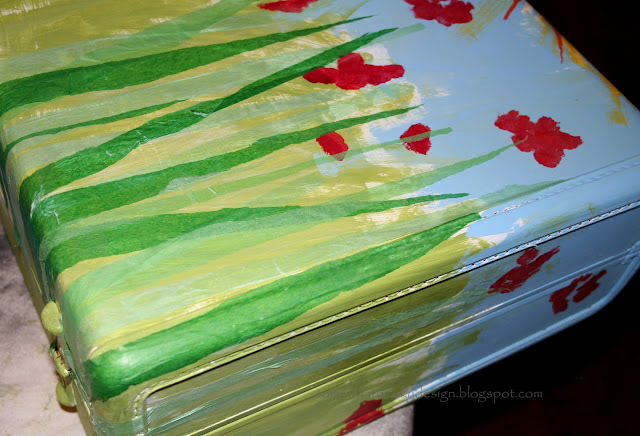 Also layers of paint may effect the functionality of the hardware. Tip: make sure that whatever you a priming is clean. I did some heavy duty scrubbing on this. It does not matter if your primer scratches easily off of the surface. Just do your best to not scratch it. There will be so many layers of stuff by the time you finish that you don't have to worry about scratching or durability. Imagine in your mind what you want your "painting" to look like. Determine what the underlying colors will be for the main objects in your "painting". Randomly apply these colors in the appropriate spots. I knew I wanted a sun, some sky, and some grass. 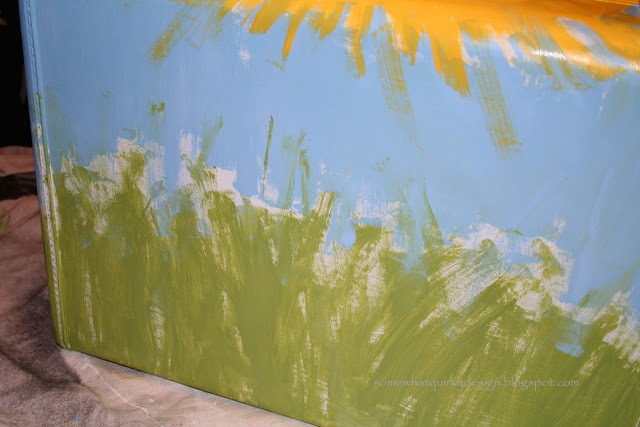 See how easy this painting is. If you can hold a paint brush you can paint this. 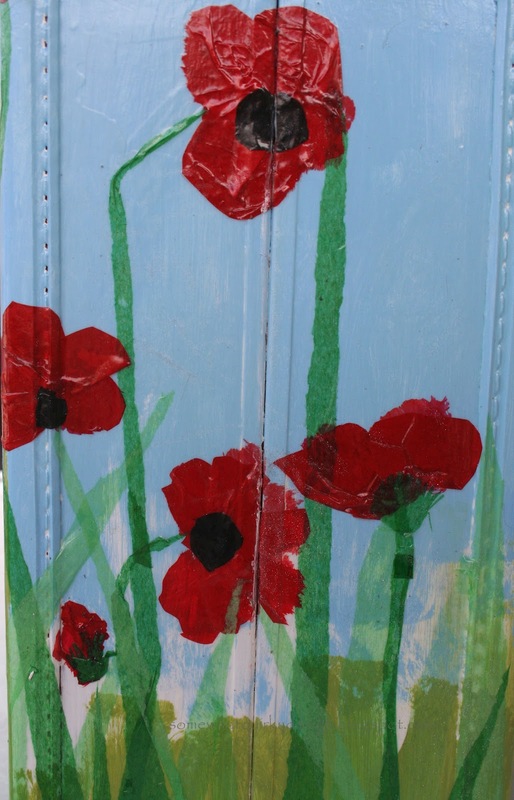 I also wanted this painting to have poppies. Don't you just love poppies???? They are so organic, so architectural, soooo beautiful.... But maybe not so easy to paint. So I googled some images of poppies and stared at them for a while - and stared some more - and stared some more. 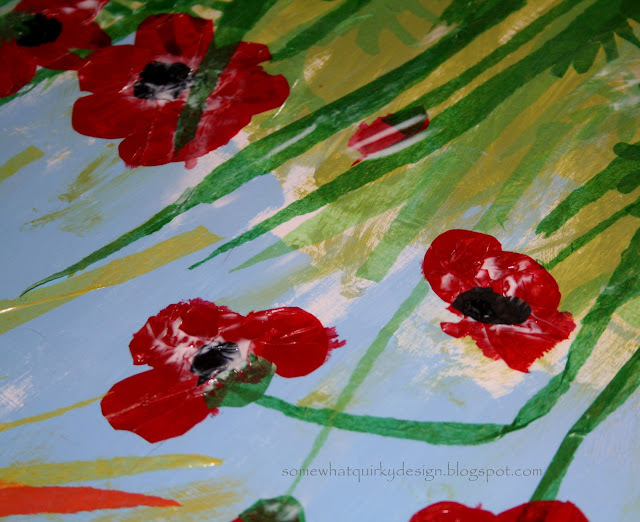 I wanted to absorb the general shapes that I wanted my poppies to have. I took the plunge for the next step. I did it. That's how I know you can do it too. 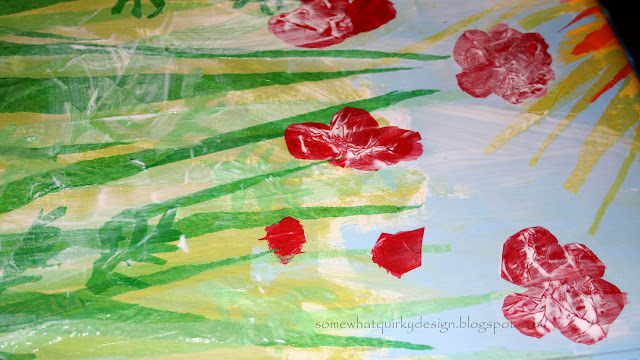 Load the brush with paint and just blob it on in approximately the shape you want your flowers to be. You are just laying the base for your decoupage layer here. Don't worry about getting anything perfect. See how these are just blobs of paint? You could probably do this with a sponge as well. The painting part is finished! Now for the decoupage part. 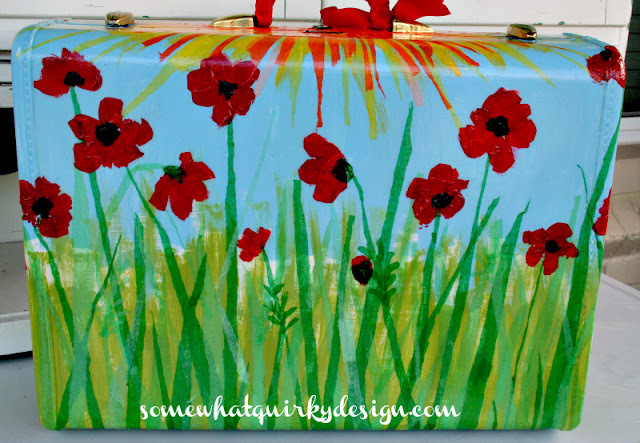 Go to your bag, drawer, box, cabinet, whatever - where you keep your gift wrapping stuff. Pick out some tissue paper in the colors you want for your painting. I used 3 shades of green, red, yellow, two shades of orange and black. Cut some squares that are approximately 8"x11" - size really does not matter. The pages just don't have to be huge. You are now ready to decoupage your painting. 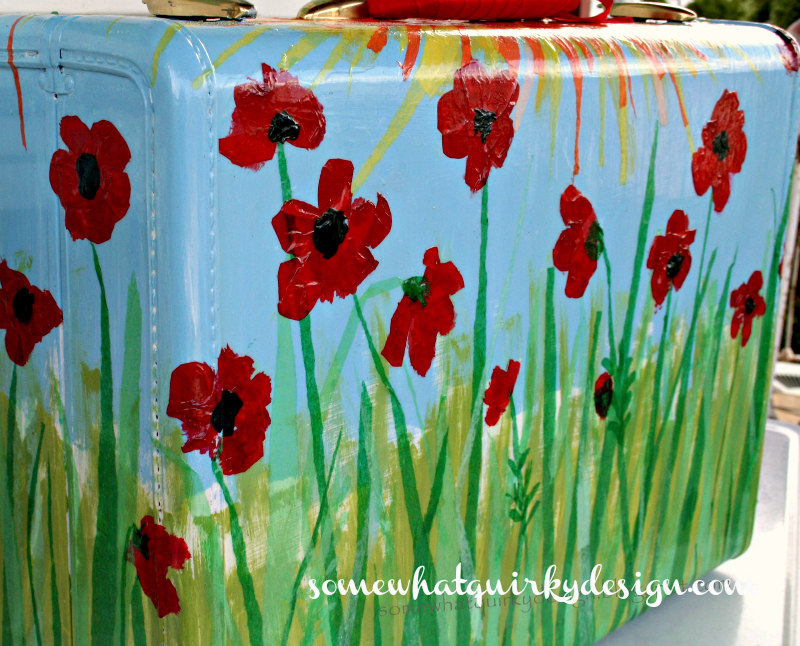 Get out your ModPodge or whatever decoupage medium you are using. For the purposes of this tutorial I will call this DM. 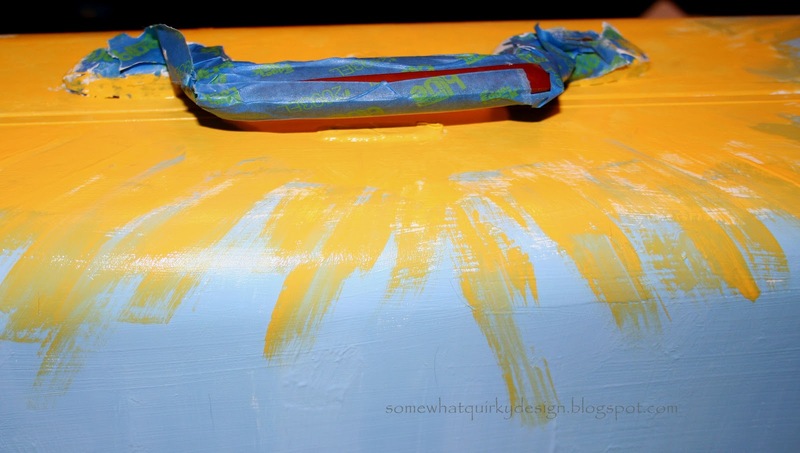 Paint streaks of DM on a small area of your painted area. Randomly apply strips of the various colors you are using for the grass. Use different colors and lengths as you go. Paint more DM over the strips as you put them on. Try not to go over the paper too many times or it will start pulling up. Apply about 1/3 to 1/2 the strips you want to end up with. Let that layer dry and then apply more to fill in as you see fit. Don't worry about your pieces going over the seams of the suitcase. Start with the lightest strips - yellow and pale orange in this case - and apply them beaming from the center of your sun. 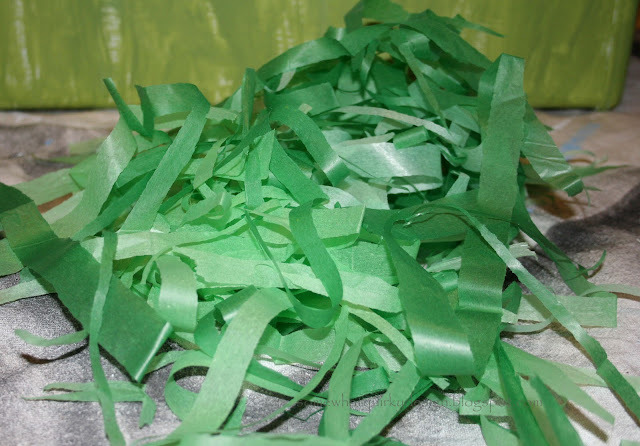 Let them dry then follow up with the orange strips. Keep the orange strips more central so you end up with the deepest color in the center of the sun with the lightest colors as your sun rays. Don't worry about your pieces going over the seams of the suitcase. 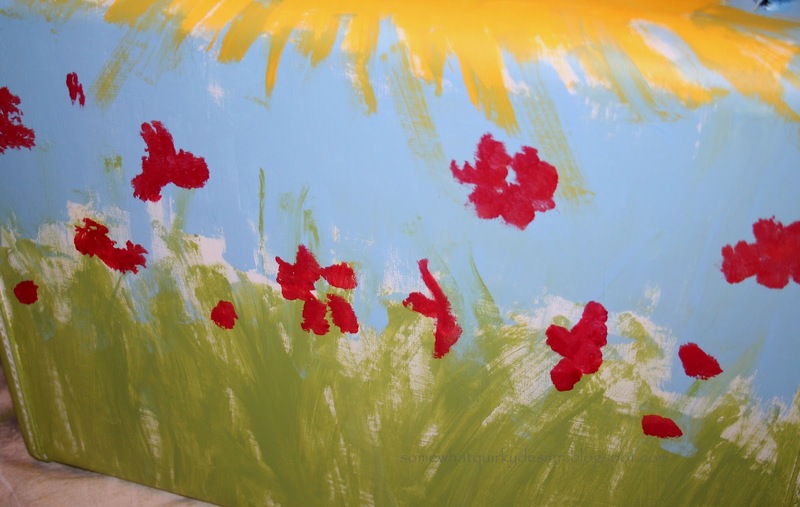 Now the flowers - poppies. 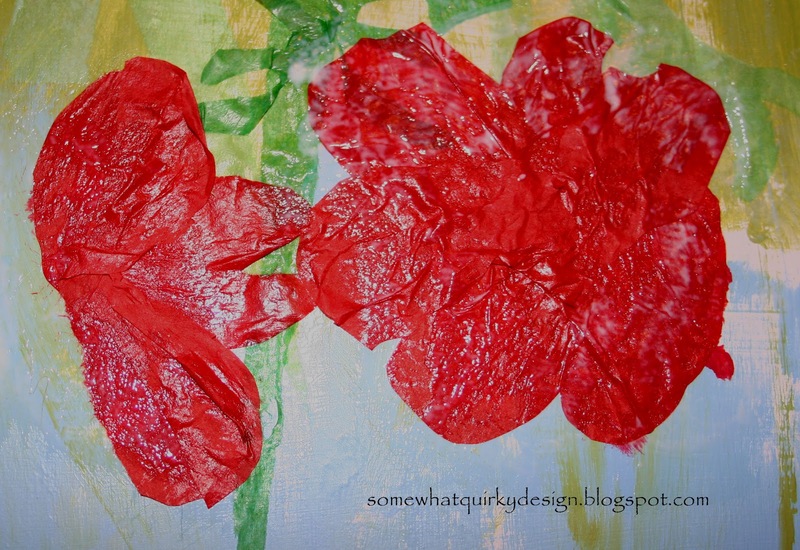 Apply circles of red tissue paper to your painted flowers in approximately the same shape of the paint you applied earlier. You are trying to make these look like petals on flowers that are facing many different angles. This is where the staring the images of poppies comes in handy. Use your big paintbrush with DM on it to manipulate the circles into the shape you want them to be. Let them get all scrunchy - I wanted them to be wavy and scrunchy like poppy petals are in real life. You do not have to fill the center of the full frontal flowers because they are going to be black anyway. Blob on a bunch of DM because you want the wrinkles in the flower to be nicely coated with DM. Use this opportunity to apply more DM to the whole piece. When the flowers are about half dry use your brush to apply some of the small black circles onto the flowers. 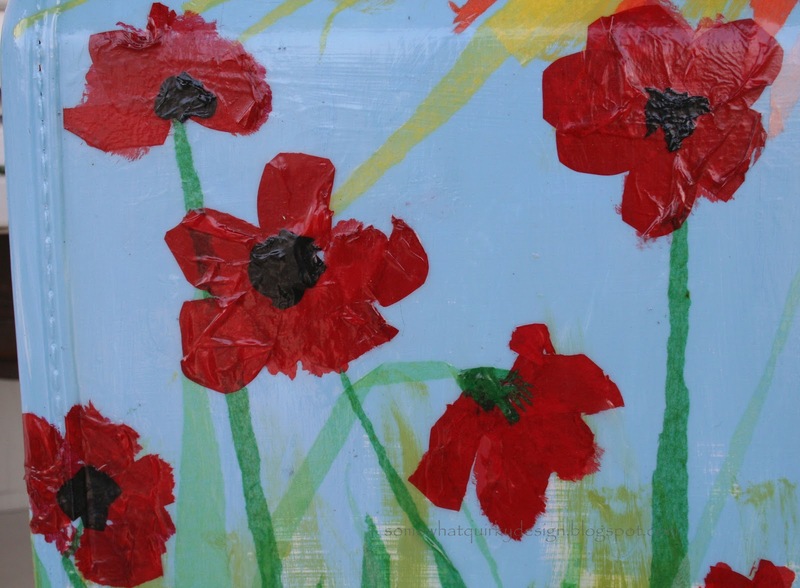 You may need to stare at your poppy images again to be reminded of the various angles you are trying to represent. Go back and fill in any areas that you think need it. I realized that lots of my flowers did not have stems so I filled in some stems. This is your chance to enhance any areas where you aren't pleased with how it is looking. Paint one more coat of DM over the whole piece. Let everything dry. 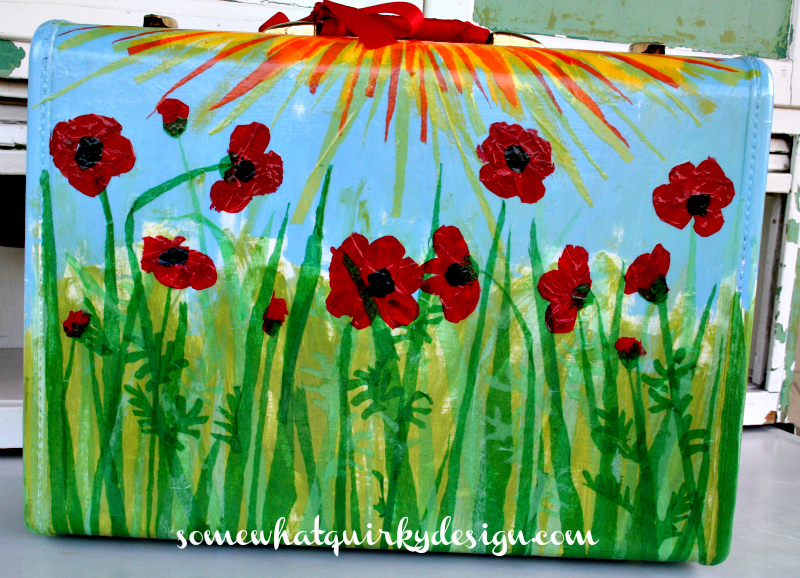 If you are using a suitcase it will be decoupaged shut. 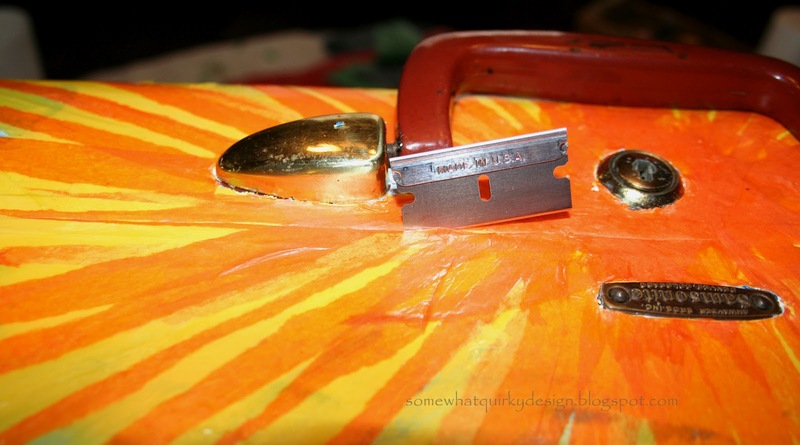 You will probably want to be able to open the suitcase - so take a razor blade or other very sharp object and cut the seam. Now take it outside or to any well ventilated area and put on your protective coating. 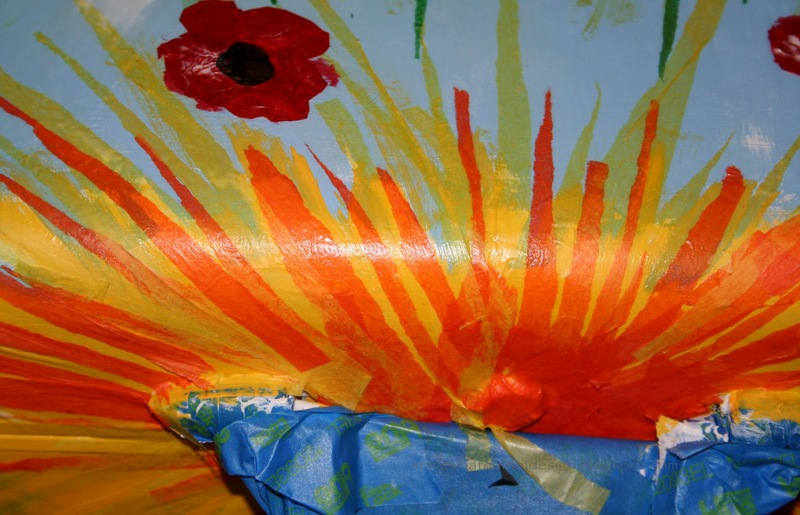 The water base of the decoupage medium should protect from yellowing. I usually add a coat of Minwax Polycrylic in addition to the DM. I don't think this is enough protection for the final product though . Then bring out the big guns. I think a good lacquer finish is called for. I use Deft Clear Wood Finish. I love this product for decoupage. It dries quickly. You can make really thick coats (be careful for drips though). It works GREAT. For the suitcases I used the Semi-gloss finish. For most products I use the satin finish. Put on enough coats of lacquer finish give it a nice glassy finish. I probably did 10 coats. Be sure to use a throw away brush, so you don't have any clean up. I like chip brushes for this, but they tend to lose bristles so be careful of this. Wrap the brush in plastic wrap or a plastic bag between coats. At this point you are DONE. However the case will smell from the lacquer and the finish needs to cure. So put it aside for a week or two for the smell to dissipate. Wrap your handle in a coordinating ribbon and tie it with a bow just for cuteness. I like the poppies very much. I tried to throw in some authentic looking leaves for the poppies. However they look pretty stupid so I quit. They aren't as noticeable when you aren't looking at a close-up. I love the gaps where the white peaks through. 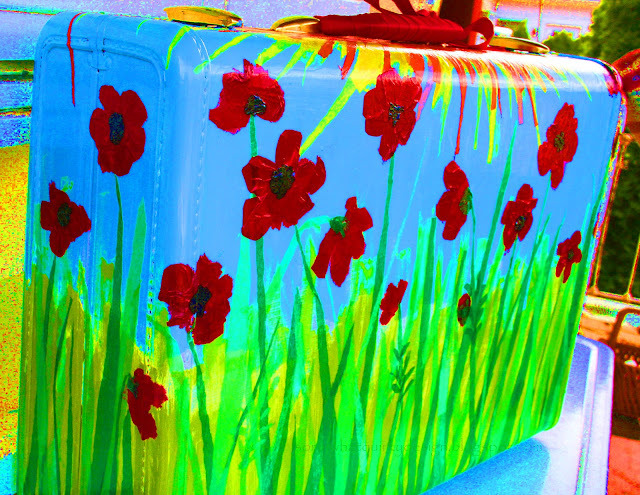 In the sunshine suitcase, I did practically the same thing - just a variety of flowers. I was trying to make this one go faster - and I was successful. Beautiful and so unique! You did such a great job! This is such a great idea and so cute! You could have fooled me that you aren't a "painter"! Thank you for the tutorial. New follower! Awesome idea and I love your job! Love, love, LOVE it! I could go on and on about how you actually ARE a painter, but you're just not allowing yourself to be. But I won't. Or I could say something like, You just might be comparing yourself to your oil-painting-daughter. But I won't. Or even something like, Anyone who has the vision to use mixed media to create this Suitcase Art is truly an artist. But I won't. These are super fun! You should be selling them on Etsy or something! Love them! hey karen, just wanted to let you know that i featured this on center of attention sunday. stop by and show off something this week too! Wow! You look like a painter to me! I love this project! This is fantastic! I love it! I have a daughter that would absolutely love one of these. Actually, I would love one of these myself. i just love the way u did the suitcases i belive u could wall art and frame it and it look great i think if down size it u could make a neat card i am always looking for diff way to make cards to let few know i care about them ty ty so much for shareing i am passing this on .